ANZ Bank’s launch of its 2015 GayTMs today has been overshadowed by a second attack on a New Zealand branch which appears to have been done by a gay rights group accusing the bank of “pinkwashing”. The Ponsonby branch of ANZ, in inner city Auckland, was last night attacked with pink paint and with posters put up on its front window which criticised the bank for commercialising gay rights. It is the second attack, in a week, on the Ponsonby branch by the group calling itself “Queers Against Injustice” and came on the same day that the bank unveiled its 2015 GayTMs in an event on Oxford St Sydney. 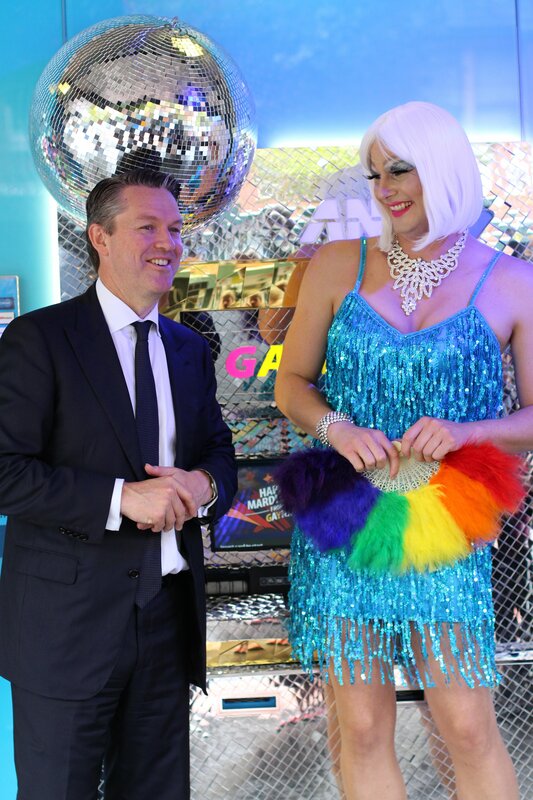 Today’s launch event saw Mark Hand managing director, retail distribution at ANZ, together with drag queen “Anzabella”, unveil the GayTMs that included a disco ball GayTM along with a ‘bat your eyelashes’ GayTM. It is the second year the bank has run its GayTM campaign to coincide with Sydney Gay and Lesbian Mardi Gras after winning a string of awards globally for its innovative use of outdoor advertising. An unknown gay activist group has since posted a statement online claiming responsibility for the attack and taking aim at the bank for commercialising the Auckland Pride Festival, which is being held throughout February. In the post the group, referencing an initial attack on an ATM last week writes: “We targeted the Ponsonby GAYTM firstly to draw attention to the commercialisation of the Pride Festival. “As queer subjects, we object to the representation of queer identity in terms of consumptive and wealthy citizens. Associating queer politics with personal banking within a gentrified area reduces the queer subject to a bourgeois, cis-gender, white, male subject, and in doing so reproduces many of the intersecting injustices by which queer subjects are marginalised. The group also claimed responsibility for the initial attack over the weekend on a Ponsonby GayTM, although it has since said the New Zealand media “misrepresented” the nature of the attack. “This misrepresentation happened through a lack of awareness on the part of the reporters supported by probable concealment of the accompanying message by ANZ, who tweeted a photo of the GAYTM with the poster on the ground. Comment is being sought from ANZ. Last year GayTMs in Sydney were also attacked however, its thought those acts of vandalism were homophobic attacks. “While we respect people have different views on the GAYTMs, we’re very disappointed that some have resorted to vandalism to make their point. “ANZ’s GAYTMs, and our involvement in the Mardi Gras in Sydney and the Pride Parade in New Zealand, is about celebrating a culture of diversity, inclusion and respect at ANZ. “It’s also a way we can demonstrate to our staff and customers the importance we place on workplace diversity and an acknowledgment of the tremendous contribution our LGBTI staff bring to community and to ANZ. Do these vandals have a point? Are ANZ trying to be seen as model citizens, when many of their investments could certainly be regarded as not for the greater good of our society? Some would say that supporting a coal terminal at Abbot Point is vandalising the great barrier reef, no? When the boffins at ANZ came up with this concept, was it because the really wanted to celebrate diversity in our society or because it is widely believed that there are lots of ‘pink dollars’ out there and they want them in their bank? The GayTM campaign is a marketing initiative, not a humanitarian gesture. Nuff said. 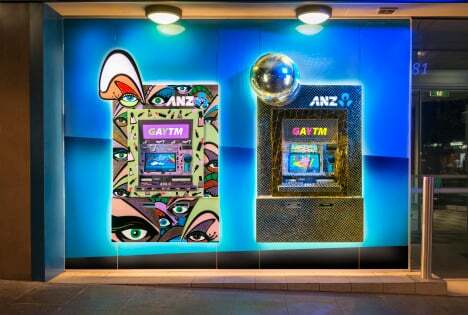 ANZ launches the GayTMs at a time of celebration of our differences. The LGBTI campaign for equality gains awareness. ANZ might gain a few from the LGBTI community, and lose a few who are less accepting. Vandalising in the name of LGBTI equality seems counter-intuitive, rather the pragmatic approach would be to encourage it. Simple… Or have I missed the point? There are so many people more greatly deserving of such ire than a corporate bank who is at least prepared to to make a public statement in support of the cause. And don’t forget, even if you are of the opinion it’s only for commercial gain, such open support of the LGBTI community could also encourage just as many homophobic people to choose not to do business with you. It’s a nonsense argument. This really does nothing to further the interests of LGBTI people at a community level, quite the opposite. And it may also discourage other corporates from following the ANZ’s example. Do something about equal marriage rights and maybe people will see the marketing stunt as something more. No gripes about Whybins winning a truck full of metal or ANZ’s motives – don’t doubt either’s motivation; however, Im not a fan simply because it deals in the very stereotypes all my gay and lesbian friends find offensive. I don’t agree with ANZ exploiting the gay community but public acts of vandalism do the community no favours at all. It only confirms in the minds of most straight people that gays are nothing more than criminals. If you want things to change, join a political party, run for political office, support candidates that support gay marriage. Simply smashing ATMs are not going to change marriage laws. Are gay people naturally drawn to gaudy and tacky advertising? This is really unbelievable. The LGBTI community are looking for wider community acceptance and instead of congratulating a major bank for its inclusiveness it punishes it. Narrow minded and completely naive. You’ll find that most corporates get behind things because of the money so complaining that they a “pink washing” is missing the point entirely. Get over it. Offal – while it is a worthy cause, there is no chance in hell a bank will lobby for equal marriage rights. To attack a corporate for showing support for LGBTI people in the community in a way that is great for raising awareness and acceptance of LGBTI rights, while having an obvious commercial benefit, is ridiculous. The same way that, I don’t know, THE MARDI GRAS is a great way to show support and acceptance for the LGBTI community, with a serious commercial upside as well. Everyone is in it for the money, in some respect. And talk about stereotypes, some of the behaviour that occurs during the Mardi Gras period is fairly deplorable and only serves to solidify negative stereotypes amongst the wider community anyway. I’m a supporter of equal rights for everyone, regardless of any perceived differences, but for crying out loud try to find the benefit in what is happening for once. Human beings love to find excuses to be negative, don’t we. I think it’s also worth mentioning that ANZ is donating the transaction fees charged for non-ANZ cards used at GAYTMs to Twenty10, a very worthy LGBTI community counselling organisation. Why do marketers insist on forcing the gay community to accept loud, gaudy colours? They simply do not go with my dress for Mardi Gras. So I want to know what other cultural community events ANZ are supporting with such pride and glamor, LGBTI is only a very small part of their workforce. What are they going to do for all the Christians, Muslims, Hindus, atheists, heterosexual families, disabled, single or married employees in acknowledgment of the tremendous contribution they make to ANZ, are we going to get ATM’s decked out for Hanukkah, Easter, Christmas, Ramadan or Deepawali? I’m not interested in banking with ANZ anymore, these new GayTM disgust me.